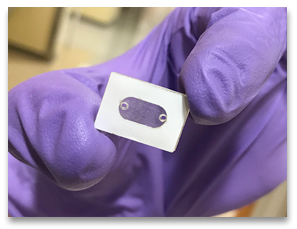 CHAPEL HILL, NC — Redbud Labs has released MXR, a microfluidic chip that accelerates molecular assays by up to 10x. Designed specifically for diagnostic consumables, MXR can be added to virtually any cartridge design. MXR is a microfluidic mixer. It delivers rapid but gentle agitation that can improve reaction kinetics, decrease variability, and simplify cartridge design. For life science assays, microfluidic mixing is a pervasive challenge that has been studied extensively in research labs. MXR is the first mixing method that was designed for real-world diagnostic consumables. With MXR, typical mixing times are comparable to pill-style stir-bars, at less than 30 seconds. But unlike a stir-bar, MXR easily integrates with high-volume cartridge assembly and multiple reaction chambers. MXR works effectively with a wide range of sample volumes, from less than 1 µL to greater than 100 µL. The chip does not introduce heat, bubbles, or significant shear. MXR is fully biocompatible. MXR is ideal anywhere small-volume agitation is desired, including reagent rehydration or mixing of two droplets. MXR has been used to make molecular assays run as much as ten times faster. MXR is the first microfluidic chip released by Redbud Labs. It uses Redbud Posts, a micro-electromechanical system (MEMS) technology conceived in Professor Richard Superfine’s research group at the University of North Carolina at Chapel Hill. Redbud Posts were designed to mimic the behavior of cilia, the microscopic hair-like structures used to manipulate fluids in a wide range of organisms, from bacteria to cells lining the human airway. To learn more about MXR and obtain a starter kit, visit redbudlabs.com.